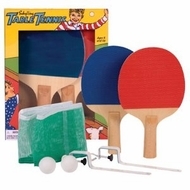 This portable Table Tennis game can be played just about any where! Easy to set up and take down, the net attaches to almost any table. Set includes 2 paddles, 2 balls, 3 net posts, and one net.